Mushirul Hasan had been a professor of history at Delhi's Jamia Millia Islamia. He later became the vice chancellor of the central university. Mushirul Hasan served as the Director-General of the National Archives of India. Eminent historian and academic Mushirul Hasan died today. He was 71. An alumnus of the prestigious Aligarh Muslim University, Mr Hasan had been a professor of history at Delhi's Jamia Millia Islamia. He later became the vice chancellor of the central university. Mr Hasan has done extensive work on the Partition of India and on the history of Islam in South-Asia. In 2002, Mushirul Hasan was elected as the President of Indian History Congress. He also served as the Director-General of the National Archives of India. Mr Hasan was admitted to the hospital last night. He breathed his last at 4 am. "He met with a road accident about two years ago and was mostly bed-ridden after that. He was also undergoing dialysis for kidney problems," former secretary to Jamia Vice chancellor, Zafar Nawaz Hashmi, said. Tributes poured on social media for the historian. His contemporary, Professor Irfan Habib described him as one of the most prolific historians of the country. "Extremely sad news. One of the most prolific historians of modern Indian history. Saw him decline gradually over the past few years after the terrible accident. RIP Mushir bhai," he wrote on Twitter. Several politicians also took to Twitter to condole his death. "A Historian, A Teacher, A Vice-Chancellor, An Archivist: Mushir ul Hasan blended all fine qualities of our syncretic culture and scholarship. His work and his books continue to shape our consciousness. Condolences to Prof Zoya Hasan & others in his family," CPIM leader Sitaram Yechury wrote. Passing away of Mushirul Hasan is a great loss not just to academia, but to all those who believe in standing up for what is right. 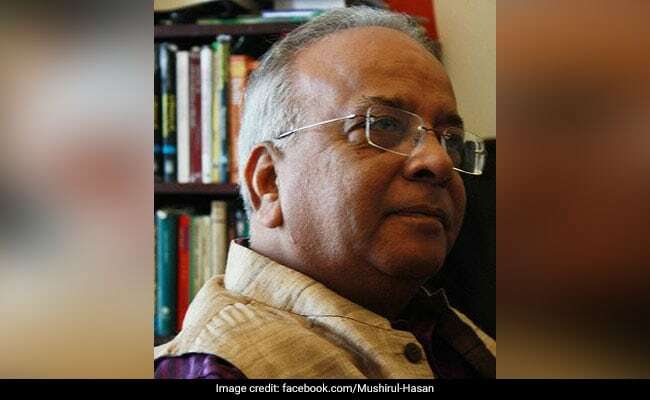 My deepest condolences on the passing away of renowned scholar and a prolific historian, professor Mushirul Hasan ji. In this hour of grief, my thoughts and sympathies are with his family and friends. "He will be buried at the campus cemetery meant for vice chancellors," a spokesperson of the university said.